Scotts Bluff National Monument – The National Park Service administers Scotts Bluff National Monument to protect 3,000 acres of unusual land formations that rise over the otherwise flat Nebraska prairie land. Scotts Bluff itself is an ancient landmark that was once part of the ancient High Plains. 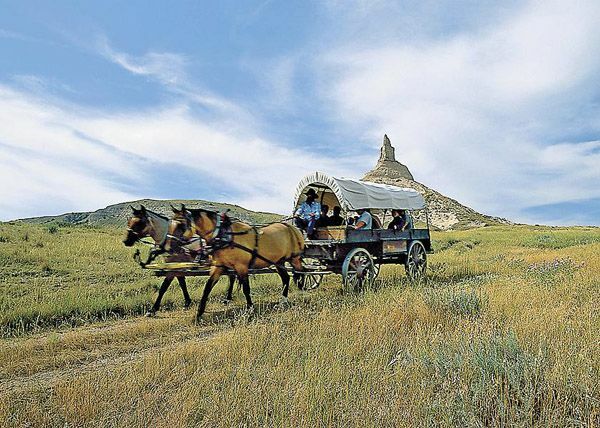 In addition to being a prominent geological feature, Scotts Bluff was a major landmark to travelers in the North Platte Valley who were part of the great westward overland migration during the 19th century. American Indians lived in the area for many years prior. The vast herds of buffalo that inhabited the region made Scotts Bluff a major hunting ground of the Sioux, Cheyenne, and Arapaho. An Indian name for the bluff is Me-a-pa-te or “the-hill-that-is-hard-to-go-around.” The bluff takes its name from a fur trapper, Hiram Scott, who died in the vicinity in 1828. See full article HERE! Horse Creek Treaty Grounds – From all directions, they came in September 1851 — Plains Indian tribes, summoned by government officials so their chiefs could smoke the peace pipe and sign a treaty with representatives of “The Great Father.” Never before had so many American Indians assembled to parley with the white man. 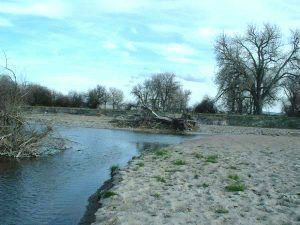 Thomas Fitzpatrick, a fur trader and Indian agent to the Sioux, Cheyenne and Arapaho, organized the council, which was originally planned to take place at Fort Laramie, Wyoming However, the size of the crowd and a shortage of forage for the thousands of horses caused the parley to be moved downstream to Horse Creek, a tributary of the North Platte River near the Nebraska-Wyoming border. Coordination took some time as most Indian camps were widely spaced as some tribes had been at war for generations. Estimates of the number of Indians gathered range from 8,000 to 12,000. Present were Oglala and Brule Sioux Cheyenne, Arapaho, Crow, Arikara, Assiniboine, Mandan, Gros Ventre and Shoshone It was perhaps history’s most dramatic demonstration of the Plains tribes ‘ desire to live at peace with the whites. The Fort Laramie Treaty of 1851 outlined each tribe’s territory, and they agreed to no longer fight each other. They also recognized the right of the government to build roads and forts on their lands in exchange for the Army’s protection of the tribes from white depredations. About 270 soldiers were present to help keep the peace; however, during the gathering, a spirit of friendliness prevailed. With the exception of hostilities following the Grattan Massacre in 1854, tribes along the trail remained peaceful until the Indian War of 1864. Near here on the Wyoming-Nebraska line is the site of the first Red Cloud Agency, established for the Oglala Sioux in 1871. Historical markers are located four miles west of Morrill, Nebraska on Highway 26 that tell the story of the Horse Creek Treaty. 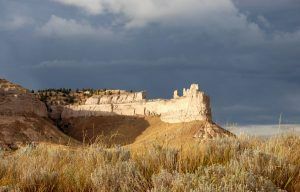 Continue your journey along the Oregon Trail into Wyoming, with more fascinating stops at Fort Laramie, Register Cliff, Guernsey Ruts, and more.